It happened. It really happened. I’ve been furiously searching all morning for a picture of it happening (the best I could do is the Goldberg ripped photo above and for pay picture at ITAT), but it happened. 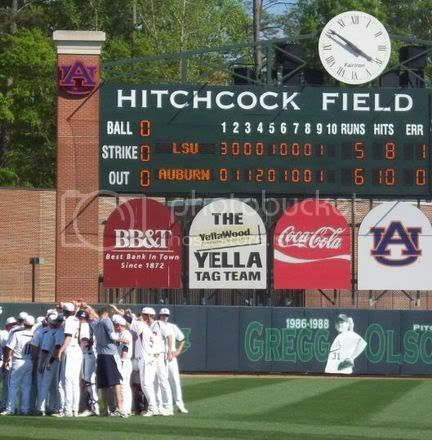 Auburn, for the first time since 1998, took a home series from LSU (snapping an 8 game losing streak to the Bayou Bengals in the process) and did it in dramatic fashion. After seeing LSU tie that game in the top of the ninth, Casey McElroy hit a sweeping double down the left field line, followed by a Kevin Patterson Nub single that put runners at the corners. Justin Fradejas came up and LSU knew what was coming. The Purple and Gold switched to 7 infielders (the regular 1B, 2B, 3B, SS positions and a man slotted right at the 2B bag). Fradejas laid down a perfect bunt, Casey McElroy charged home, then slid just under the tag. Good Tigers won in dramatic fashion. Coach Pawlowski got one of his biggest wins here at Auburn and Auburn gets a huge confidence boost while we run down the home stretch. Official recaps, as usual, are here here and here, and I’m sure I’m a little late to the party with recaps from Auburn beat writers already filed. However, here’s a couple of things I observed this weekend. That 8th inning was huge. 4 pitches and you retire four LSU batters. I’m sure Austin wishes he could give back that Solo HR to Dishon that tied the game, but to Hubbard’s credit he responded and limited the damage to just one run, and gave Auburn a chance to win it in the bottom of the ninth. What can you say about Cole Nelson? I’m not sure. He’s had 2 terrible starts (vs ASU and vs LSU) and they have some very eerie similarities. Both starts were at night and both were on a short rest when Nelson was bumped up a day (from Sunday to Saturday vs ASU; and from Saturday to Friday against LSU). Not telling what the real reason is, but for Auburn’s sake, let’s hope he can bounce back. As for Sunday? That’s Grant Dayton’s to lose at this point, leaving the 3rd starter still up in the air. THE CASE FOR GILMER- I wouldn’t be surprised to see Wes Gilmer get more playing time at 3B. Gilmer came in Friday after Dan Gamache lazily missed a foul popup on the 3rd base line. Then, his Saturday performance was outstanding making at least 3 dazzling plays to keep the game close. On Sunday, he saw a bit of action late in the game as well, when Auburn needed a surer hand in the field. Defensively, I have to give the edge to Wes right now and that 3B position, which has plagued AU all season, needs all the help it can get. LINEUP SHUFFLE- Trent Mummey returned to full strength this weekend and it did impact the lineup, mainly on Sunday. With Trent actually in the field and not DHing, it bumped Creede Simpson completely out of the lineup (in favor of Kevin Patterson). Now, the question remains, how will Pawlowski find a spot for Simpson? Will he give him a try at 3B or just send him as a DH when the pitching matchups come up? Another way the lineup was shuffled was Tony Caldwell catching all three games over Ryan Jenkins. Offensively, Tony is better than Jenks, but defensively, Jenks is better than TC. It’s yet another matchup that Auburn fans need to keep an eye on. Finally, some breathing room. AU sits just a game out of third and now has a tiebreaker with the team right above them. Another big weekend coming up, against Vanderbilt, and if Auburn can take 2 out 3 in Nashville from the doors then we can finally, really relax. Great recap. Between this and your twitter feed, nobody can touch your coverage! I think we go 5-4 in our next 9 and then 6-3 in our last nine... 18-12. Good for 3rd/4th maybe?